At least the Globe editorial board and I agree on one thing: we are having an election on May 2, that much is true. No – I kid. The Globe & Mail has come out with their public political endorsement, said some pleasant things about all party leaders, and thrown their considerable, national weight behind Stephen Harper and the Conservatives. Quickly, I just wanted to comment that there has always been something about a major media outlet (any major media outlet) publicly endorsing a political candidate that sticks in my craw. All media sources have their leaning, this much is true: but there is a fine line between using your editorial powers to persuade and cajole, and another to come right out and tell your readers who they should vote for. It always feels like an abuse of power to me, and I assure you I would feel the same way had the Globe recommended you vote for any other political leader in this country. This, at least, is not about partisanship. But my agreement stops there. Where I diverge from the Globe is on the emphasis that I place on different aspects of the campaign. It comes down to the importance you place on the economy, and the importance you place on…well, just about everything else, including democracy itself. 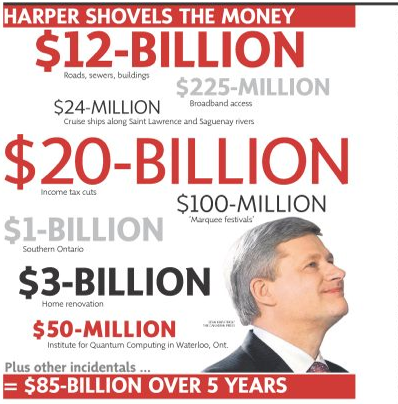 I will commend the CPC for their doling out of stimulus cash in 2008 (although hate them for the plethora of Canada Action Plan signs they left in their wake – but don’t get me started on the damn signs) and their smooth running of the economy. But unlike the Globe, I cannot look to a Canada in the future where a stable economy is the only thing that gets me up in the morning. Such is not the stuff of legend, or nation-building. It is the stuff of status quo. And while we are immensely lucky to live in Canada, I would hope that campaigns would be when bigger, bolder ideas would come to the forefront, and people could talk about competing ideas for Canada, and not bog down in the he said-she said of fighter jet costs. And I walk away from the Globe’s debate completely when I hear them say that “during his five years in office [Harper] has demonstrated strength of character, resolve and a desire to reform.” Desire to reform? What about Senate appointments? Strength of character? What about proroguing Parliament. Twice. That took a lot of character. Resolve? Like when he resolved to give Toronto $0 and Huntsville $50M in legacy money for the G8 after Toronto was sacked last June? Come off it, Globe. We differ because you are willing to say that a strong steward of the economy is the ONLY thing that matters in 2011. You placate other issues such as health care and national security and climate change, but it always comes down to the dollars and cents. We differ because I cannot so easily get past Harper’s sense that Canadian Parliament bothers him. That we stand in his way, and that you want to give power to a man who behaves like an abusive drunk to the people who don’t vote for him. So while I am glad you at least say that “Mr. Harper could achieve a great deal more if he would relax his grip on Parliament, its independent officers and the flow of information…That is the great strike against the Conservatives: a disrespect for Parliament, the abuse of prorogation, the repeated attempts (including during this campaign) to stanch debate and free expression,” I am disappointed that these egregious acts of disrespect for Canada and our institutions are not enough to give you pause.